Q- If I have endometriosis, does it mean I am infertile? A- No, that isn’t the case. Though endometriosis is definitely one of the leading causes of infertility in women, most women who have this condition don’t have problems conceiving. The ones who are impacted the most are ones in whom the displaced endometrial tissue has caused blockages/ scar tissue on the woman’s fallopian tubes or ovaries and prevent the egg and sperm from meeting. In some cases, the woman may have developed ovarian cysts called chocolate cysts ( endometriomas) which affect ovulation . In most cases, your doctor will do an ultrasound scan to check if you have chocolate cysts. Some may do a laparoscopy to check your anatomy, to see whether the endometrial tissue is compromising your fertility. 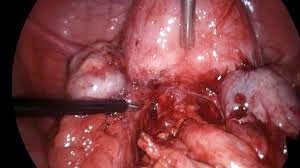 If that is the case, the excess endometrial tissue and scar tissue can be removed . As you can see, it's not always possible to correct all the abnormalities which endometriosis can cause, and for many patients who want to have a baby, IVF is the most direct route because it allows us to bypass all the in vivo hurdles. Q- Do I have to go under the knife to get my endometriosis treated? A-That’s not always necessary. Your doctor will suggest that your endometriosis be treated only in case it’s causing you any problems. In certain cases (like the ones in which it isn’t impacting your fertility in any way), your doctor may only prescribe OTC medications to alleviate any discomfort during menstruation. Some women also suffer chronic flare-ups and these too can be kept under control with medication. Your fertility specialist will decide what the best plan of action is in your specific situation. Q- Is endometriosis a permanent condition? Am I going to have it for life? A- Its very difficult to tell; for number of women, pregnancy or menopause tends to provide a break from this condition and the majority of its side effects. However, there are some cases in which endometriosis persists. If this is the case with you and if the medications are ineffective in providing relief, your doctor may suggest you opt for a full hysterectomy. That is the only way endometriosis can be completely eradicated. Q- If I have endometriosis, which are the fertility treatments available to me? A-This is dependent on the severity of your endometriosis , your age , as well as your treatment history. You will need to get a full fertility work-up done; this will help in identifying whether any other fertility issues exist. Your doctor will discuss options such as IVF or IUI with you, once all your tests have been completed.